Beneath the Hotline Miami series’ savagely violent mind-trip lies an acutely intelligent narrative—one that questions players’ moralities. But what I really wanted to know was whether the games’ cover artist would also give free pizza and snacks as his in-game character Beard does. So, I asked him. 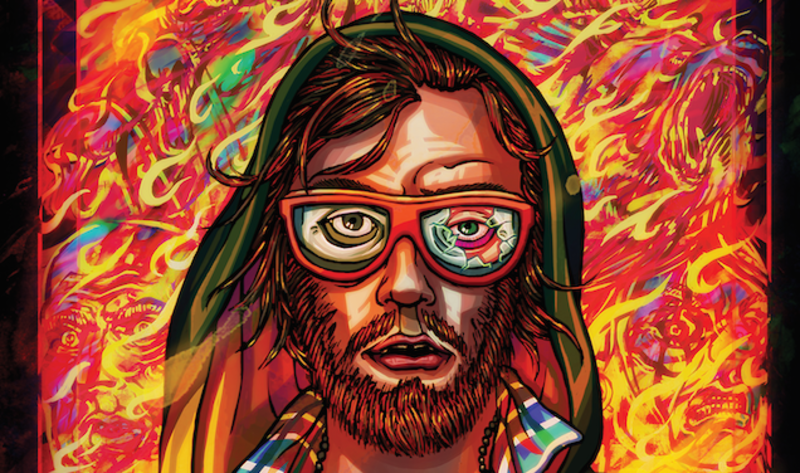 Niklas Åkerblad isn’t just the character Beard in the series whose face graces the cover art of Hotline Miami 2: Wrong Number. He’s also the cover artist responsible for setting the visual tone of both of Dennaton’s popular top-down action games, while also making musical contributions to their soundtracks under the pseudonym El Huervo. But his accomplishments aren’t only tied to Hotline. He has worked on other games such as 2015’s Else Heart.Break(), and recorded multiple albums. Following the success of the series, the Swedish artist and musician spends his time juggling multiple projects, as he told me over e-mail last week. We discussed a broad range of topics including the differences between creating music and art, his inspirations, favorite anime and games, some of his thoughts and work on the Hotline Miami games and his reaction to his character Beard being killed off so spectacularly. The Hotline soundtracks are a diverse collection of songs from various artists. The tracks are pulsating, mesmerizing, and meditative. The songs are as much a part of the series’ dynamic identity as its stylized goriness and striking visuals. Pop-cultural influences have impacted his work, too. Harry Martinson’s poem, Aniara, was influential in creating some of his paintings and his game, Else Heart.Break(), with Erik Svedäng. Bloodborne, which is one of his favorite recent games, is one of his biggest pop-cultural influences along with S.T.A.L.K.E.R, and Silent Hill. But videogames aren’t the only influences with Usagi Yojimbo by Stan Sakai, Moebius and painters Camille Rose Garcia and Edward Hopper being some others. Richard is quite the mysterious character in the Hotline games. Since the last Hotline Miami game, Åkerblad continues to channel his creativity into multiple projects including painting and making music. Oh, right. And as for Beard, would Åkerblad also give out free pizza and snacks as his Hotline character does?